This special column by Appalachian Voices Executive Director Tom Cormons was published in the April/May 2018 issue of The Appalachian Voice. How much money would you consider to be “just compensation” to exchange your right to peaceful enjoyment of your homeplace for living with a massive pipeline carrying natural gas under super-high pressure through your land, creating a scarred, unusable and potentially dangerous area? What is a fair price for worrying that the pipeline construction would ruin your community’s water supply? What if you had no choice in the matter, but were forced to take the cash from the pipeline company and watch your property value sink? 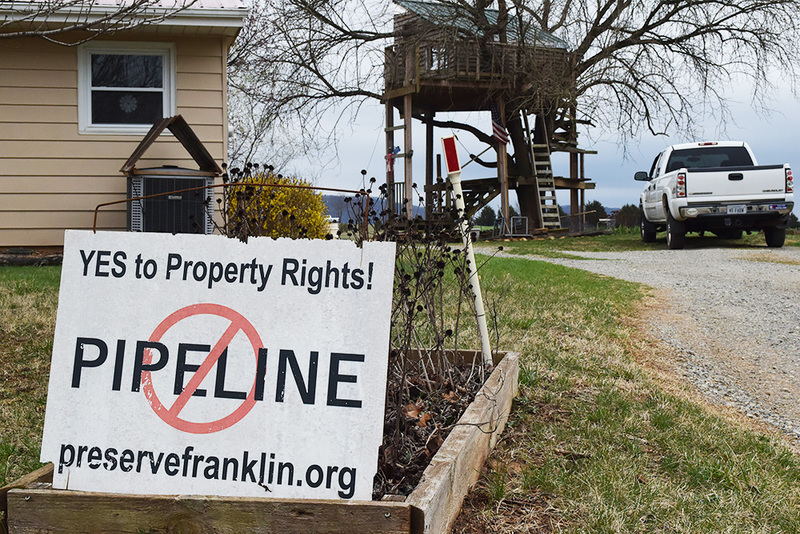 Such is the predicament of countless landowners across our region, including residents along the routes of the massive proposed Atlantic Coast and Mountain Valley pipelines. For this special issue, we spoke with several of them. Each has a different story to tell, but all are casualties of the unjust — and well-paid-for — influence that corporations wield over our government, as well as the latter’s complicity. Across the United States, the fossil fuel industry is increasingly taking private land to build pipelines that most definitely do not advance the public good. The Mountain Valley and Atlantic Coast fracked-gas pipelines are no exception. On the contrary, ample evidence shows they would almost certainly pollute hundreds of waterways across three states, pose grave health and safety threats to communities, add millions of tons of greenhouse gas to the atmosphere every year, harm local economies, and increase energy costs for customers. For almost four years, thousands of citizens have fought these proposed projects. They submitted comments to government agencies, traveled long distances to speak at hearings, engaged the media and contacted their elected officials. As you’ll read here, their lives have been hijacked by this fight, but they are compelled to defend their homes, families and communities. So why are miles of forest along the routes already clearcut and giant bulldozers poised to begin gouging the earth? The almighty dollar, of course. Dominion Energy, lead developer of the Atlantic Coast Pipeline, and EQT Midstream Partners, LP, lead developer of the Mountain Valley Pipeline, have easily leveraged a rigged system that disadvantages ordinary citizens and allows companies to rake in huge profits. The Federal Energy Regulatory Commission oversees interstate natural gas pipelines, and in October 2017, it approved both pipelines at 7 p.m. on a Friday. Instead of subjecting the projects to rigorous analysis to see if the natural gas is actually needed — a crucial test for determining public good — it accepted the “self-dealing” contracts that Dominion and EQT had made with their own affiliates as proof. This is common practice for the agency, which has rejected only two projects out of 400 since 1999. In a surprise move, though, Commissioner Cheryl LaFleur issued a forceful dissent, explicating that the projects are not in the public interest and highlighting how FERC’s process puts ratepayers, the environment and the climate at risk. Similarly, a few months earlier, outgoing Commissioner Norman Bay called for major changes to FERC’s review of pipeline proposals, including determining whether more capacity is actually needed, assessing life-cycle greenhouse gas emissions, and improving transparency and public participation. When FERC approves pipelines, it conveys extraordinary power and profit to the companies involved; they can seize people’s property through eminent domain and bank on a virtually risk-free profit of 14 percent. There’s no reason a gas company or utility wouldn’t want to build a pipeline, landowners and the environment be damned. But the resistance is growing. In addition to the thousands who have voiced opposition to the Mountain Valley and Atlantic Coast pipelines, elected officials are putting distance between themselves and powerful utility interests. 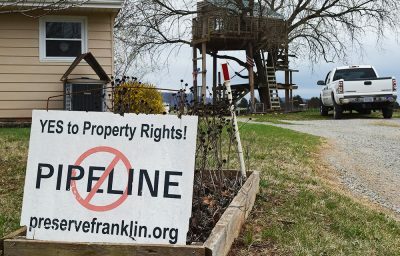 In Virginia, more politicians are rejecting campaign contributions from Dominion, and at least nine bills were introduced in the General Assembly aiming to restrict pipeline projects in various ways. Hundreds of landowners on both routes refuse to take easement purchase offers, forcing the companies into court. As we go to press, two bold souls in West Virginia are staging a tree-sit along the Mountain Valley Pipeline route to stop clearcutting in that area; further protests are likely to arise. Appalachian Voices, standing shoulder-to-shoulder with landowners and partner organizations in the region and nationally, remains committed to fighting the Mountain Valley and Atlantic Coast pipelines. Yet, as devastating as these projects are, they are precursors for what could be coming to Appalachia (read the Voice story here). The fossil fuel industry and monopoly utilities, and their political abettors, will not turn easily from their money-making course. We citizens must continue to call them out, hold them accountable, and push hard for a future that is economically and socially just, and environmentally sustainable. It’s just over the horizon. Appalachian Voices' Executive Director, Tom holds a degree in law from UCLA and has a life-long appreciation for Appalachia's mountains and culture. An avid hiker and whitewater rafter, his latest pleasure is in sharing with his kids a deep respect and appreciation of nature.